Several years ago I have already created a blog about this topic. 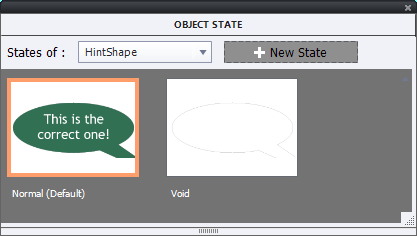 Meanwhile Captivate has added a lot more features: multistate objects, changes in system variables, easier commands etc. Since that question often appears on social media and the old post is also still visited daily, time to offer an easier way. It is also a use case illustraing use of a system variable, following to my recent posts about system variables. Here you'll discover how you can use an Interactive Video to as training asset for a workflow. It is up to you: video or step-by-ste textual instructions with screenshots. Why do I prefer a Shape Button? Buttons have InBuilt states and can have supplementary custom statesI. You can find more info in this article: States and State Commands. Captivate has 4 types of buttons, which have 4 InBuilt states: ‘Normal’, ‘Rollover’, ‘Down’, and ‘Visited’. They can all have extra custom states, which allows to create nice toggle buttons showing the situation at that moment. Examples: TOC open/closed, Audio playing/muted, CC visible/invisible etc (have a look at: 1 action = 5 toggle buttons). The three first states are included in the object style of the button or the shape, the Visited state is not included. Custom states are neither included in the button style. Text buttons, Transparent buttons (which are not necessarily transparent), Image buttons can NOT be used on master slides, can NOT be timed for the rest of the project. A shape button can be used on master slides, can be timed for the rest of the project. For a toggle button Play/oause this is a big advantage: you need only one shape button for your project. If you prefer one of the older button types, you would need a button on each slide. The movie is based on a Video Demo. The CPVC-file was captured at 1280x720. It is embedded as interactive video in a cptx-rpoject with a resolution of 1024x627. The ratio widht/height is not the same because the synchronized interactive video has a top control bar. I extended the functionality of Interactive video, you'll find some tips in my next post. You have to know the situation at the start of the course. By default (after having launched the course) this will be 'Play’ situation. Consequence: the start look of the Shape button has to be ‘Pause’. It is not possible n Captivate to create states for a shape button on a master slide . You have to create that button on a normal slide,. Create a shape and check off the option ‘Use as Button’. 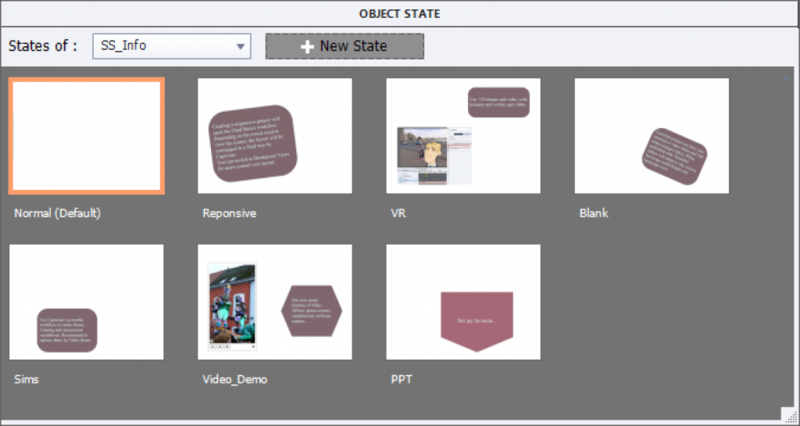 Open the State panel, using the button ‘State View’ in the Properties panel. In the Normal state, fill the shape with an image and/or text you want to show when the course is playing, to pause the course. Delete the InBuilt states ‘Rollover’ and ‘Down’, using the right-click menu on those states (you cannot use a simple Delete key). In this custom state fill the shape with an image and/or text you want to show when the course is paused, to resume Playing. If you want to use the Play/pause button on all slides, and you are creating a non-responsive project or a responsive project with breakpoint views, the easiest way is to copy/paste the button to the Main master slide. The daughter master slides can inherit the button. Careful: in some themes the Title master slides is not using the main master slide objects, you’ll need the button also on that master slide in that case. For a fluid boxes responsive project, you cannot use the main master slide (cannot have fluid boxes). You will need to insert the button on each used master slides where you want that functionality. To turn off the pausing point: open the Actions tab of the button, and uncheck the option ‘Pause project until user clicks’. For a Fluid Boxes project: object timed for the rest of the project is normally not possible. I explored and found it iw possible but with the requirement that you use the same master slide for all content slides. Explanation: I am checking the value of the Boolean variable cpCmndPause (see article). If that value = 0, the course is playing. 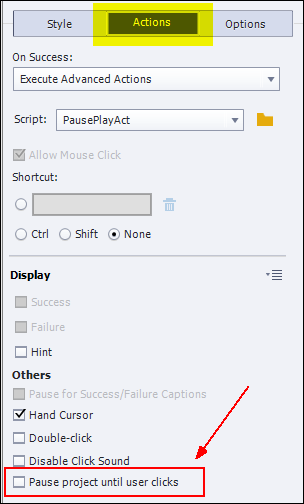 In that situation I will use the command ‘Pause’ (‘Pause’ is exactly the same as ‘Assign cpCmndPause with 1) and change the state of the button SB_PausePlay to the Play state. 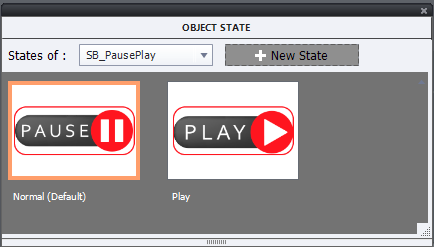 If the course is paused however, that variable would not have the value = 0 (but = 1) and the ELSE commands are done: the state of the button is reset to Normal, and the playhead is released by the command ‘Continue’ (which is the same as Assign cpCmndResume with 1, which is also setting cpCmndPause back to 0). Warning: not everything is ‘paused’! Animations of all type (animated GIF, SWF, OAM….). You would have the same situation with the Pause button on default Captivate playbars. It is not due to the fact that this is a custom button. The hotspots get a checkmark after having been clicked. However only the status ‘Exploratory’ is used, not the ‘Guided’ status. I would be able to reproduce that as well, but the workflow will be more complicated. Watch the result in this movie with 3 slides. After the title slide you’ll see the hotspot slide. The last slide lists up the steps explained below, if you want to create the workflow from scratch. I will also offer you the project file, you can also copy/paste the hotspot slide to your project, thus allowing to skip some steps. You can download the project file (created in version 11.0.1.266) from this link. You can copy/paste the hotspot slide (slide 2) to your project. Replace the image. You can edit the design of the hotspots (names start with HS_), change the content of the states in the Multistate object labeled SS_Info. Have a look at the Library, folder Shared Actions. You’ll see that it has been used 6 times, once for each hotspot. 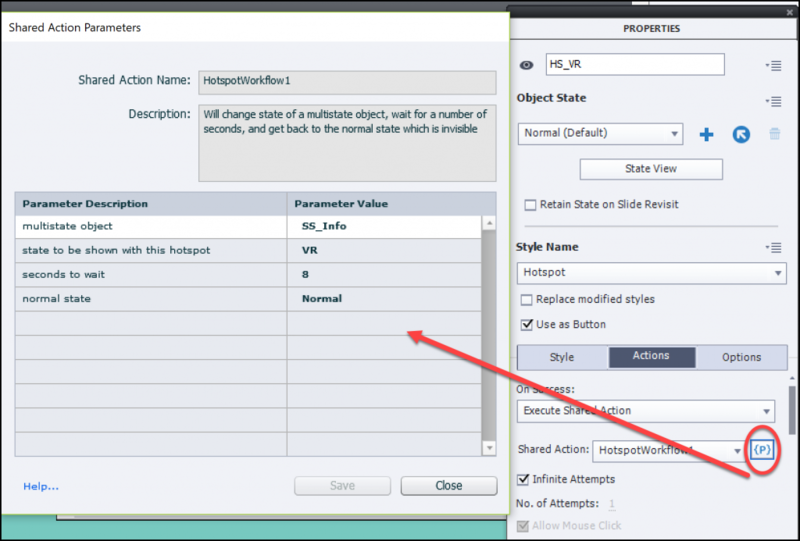 If you change names of the states in the multistate object, you will have to edit that parameter. Same for the duration. The other parameters are always the same for each hotspot: the name of the multistate object and its Normal state. I labeled the used style as ‘Hotspot’. However, the Visited state is not part of the style (which I regret a lot). For that reason I did duplicate the hotspots (CTRL-D). In the project the names start with HS_. In the example movie you’ll see 6 hotspots. Contrary to the hotspots in a VR project, these hotspots have a timeline. I kept the default setup: duration of 3 seconds and pausing at 1.5secs. That pausing point is where where the playhead will pause, exactly like for the hotspots on a VR slide. Use File, Import, External Library and open the file you downloaded. Find this shared action in the floating Library panel which will be opened. 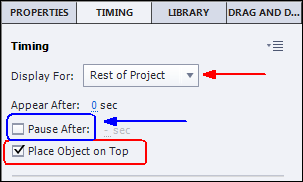 Drag that action to the Library of your project in the folder Shared Actions. More info about external libraries in this post. 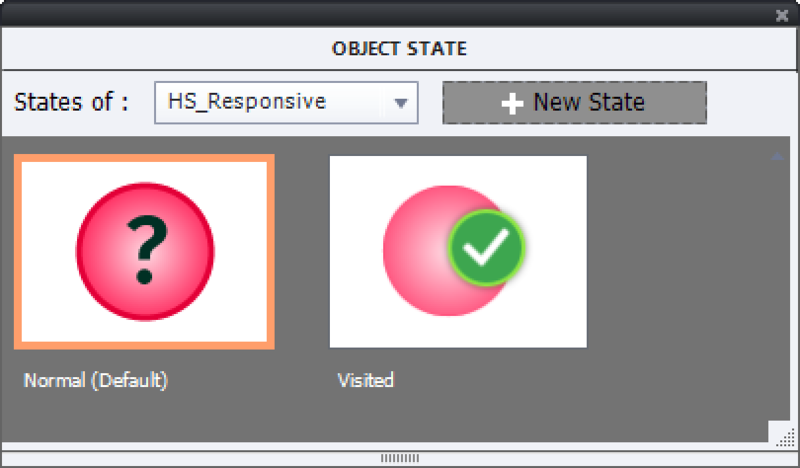 Multistate object with the popups (labeled SS_Info) in my example file. That parameter is the same for all hotspots. Normal state of the multistate object, is same for all hotspots. Maybe you’ll already feel that this workflow could be optimized. I would prefer to give the learner control over the time he needs to watch the popups by adding a close button. Or maybe cover up the distracting background in a lightbox style? What about the next button only appearing when all hotspots have been clicked? Or a warning if not every hotspot has been visited when the learner clicks the Next button? Lot more workflows are possible, let me know which one you would prefer?